This SPSS Excel tutorial explains how to perform one tailed and two tailed Independent T Test in Excel and SPSS. Independent T Test Test whether the population mean from two individual samples are equal. For two samples, you can also use One Way ANOVA, but ANOVA is not directional. 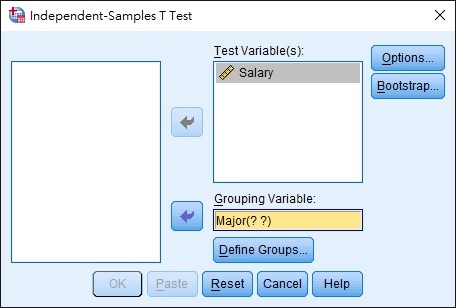 Independent sample T Test can have to types: equal population variance and unequal population variance. 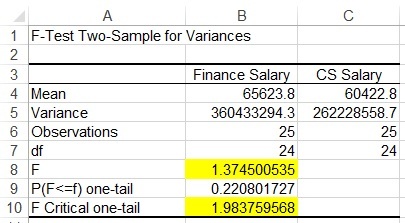 In Excel, you can use F-Test Two-Sample for Variances to test the probability of equal variance before you select the appropriate T Test. In SPSS, when you generate the test result for Independent-Samples T Test, F value will be generated under the section Levene’s Test. Suppose we try to find if Finance graduates have a higher salary than computer science graduates. Because our H1 is directional, the test is 1-tailed. Before doing T test in Excel, make sure you have enabled Data Analysis Add-In. Prepare a data source as below, and then calculate the sample variance using VAR.S Function. Fill in the Variable 1 and 2 Range. 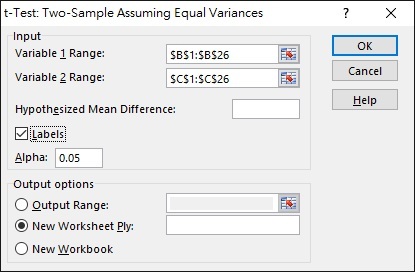 Note that for Variable 1 Range, you have to fill in the larger variance one, that’s why we have to calculate the sample variable previously. 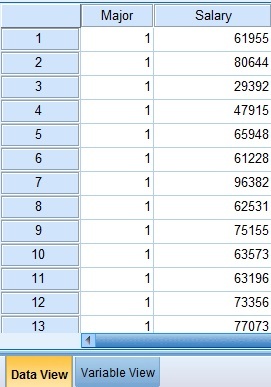 Now a table is generated. The null hypothesis is the variance is equal, at confidence level 95%, F value is 1.9837, now the calculated F value is only 1.37, therefore we do not have enough evidence to reject H0, meaning the variance is equal. Since we have tested that the variance is equal, now we select Data analysis t-Test:Two-Sample Assuming Equal Variances. Otherwise, select t-Test: Two-Sample Assuming Unequal Variances. 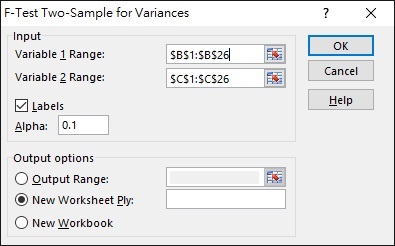 Again, select the higher sample variance range for Variable 1 Range. 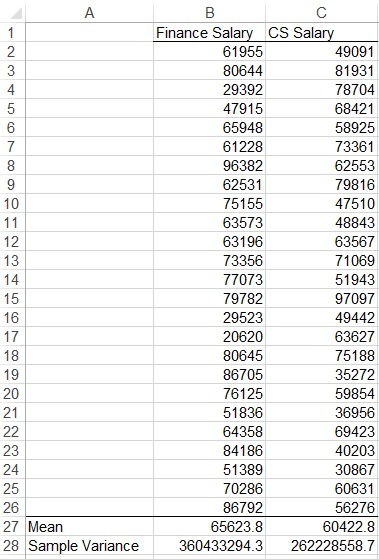 Since t Stat (1.042) is less than t Critical one-tail (1.677), Ho is not rejected, meaning salary of finance graduate and cs graduate have no difference. Prepare your data source as below format. 1 is Finance, 2 is CS. We have to define Group 1 as 1 (Finance), Group 2 as 2 (CS). 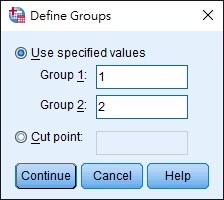 SPSS calculates the T statistics using Group 1 mean – Group 2 mean. If we want positive T statistics, Group 1 mean has to be larger than Group 2. SPSS has no specific procedure or dialog box to run a one-tailed test for differences of means. The procedure for the one-tailed test is the same as for the two-tailed test. There are two issues here, though. First is to have an idea of which direction you want the t-statistic to go. If you expect that group 1 has a higher mean than group 2, you will be looking for a positive t-statistic (since SPSS will use the mean of group 1 minus the mean of group 2 as the numerator in computing the t statistic). Make sure that you know which direction the t statistic is going and what that direction indicates. There are two parts of testing in the Independent Samples Test table. On the left hand side is the Levene’s Test, Ho assumes two variances are equal. Since the significance level >0.05, we do not reject Ho, meaning the variances are equal. 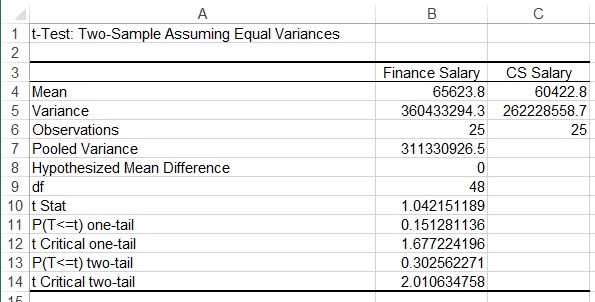 On the right hand side of the Independent Samples Test table, it shows both results for equal variances and unequal variances. Based on the Levene’s Test on the left, we only read the data on the top row (equal variances). Finally since we are testing one tailed, we divide the two tailed probability by 2, then we have P value 0.151. Since P > 0.05, we do not reject Ho, meaning salary of finance graduate and cs graduate have no difference.